This article was unpublished due to lack of space. Now that a new year has begun, some of you may be wondering where things stand with new proposed septic regulations that are likely to have a major impact on our Russian River community. AB885 goes back to the drawing board…. Water Supply needs prioritized over clean water….. Increased State approved recycled wastewater may run off into city streets next summer as regulatory oversight is about to become less rigorous, reflecting strong pressures to increase wastewater reuse to stretch the summer potable water supplies. The goal is to offset California’s potable water use by 2.5 million acre feet (about 812 billion gallons) with irrigated wastewater by the year 2030. The practice is not limited to urban areas, as emphasis on irrigated wastewater expansion is aimed at agriculture as well. 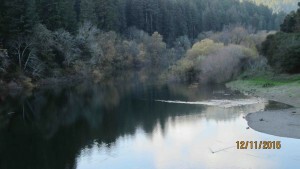 Estuary Lawsuit Settled: A Brief History…..
A year has gone by since the Sonoma County Water Agency (SCWA) Board of Directors (County Supervisors) authorized the Final Environmental Impact Report (EIR) for the Estuary Project, a plan to construct a channel to keep salt water from intruding into the Estuary, but allow fresh water to seep out. The purpose was to raise fresh water levels in the estuary lagoon to benefit the growth of juvenile stealhead fish preparing for their ocean sojurn. What we don’t know can hurt us….. In the 1950’s, medical doctors extolled the virtues of smoking cigarettes in public advertisements. People were lighting up in restaurants, airplanes, movie theaters and almost everywhere. As late as the 1980’s, smoke was so thick in the main room of the Santa Rosa Vets Auditorium bingo games, that one could barely see across the room. Recycled wastewater runoff: why you should care…. “Toilet to tap” is on its way…. What does “toilet to tap” conjure up in your mind? Are all substances going down our toilets and sink drains totally removed before being recirculated into our drinking water supply, our recreational waters, and our environment? In California, only 125 chemicals of the over 80,000 that exist are regulated. About 870 of those chemicals, sometimes at minute exposures, have been linked to such diseases as autism, obesity, diabetes, cancer (especially of reproductive system), birth defects, Parkinson’s, heart disease, and more. Irrigation runoff: wastewater ‘reuse’ is the new discharge…..